The Educational Resource Center Meeting Rooms are available for meetings and events! Seated capacity 126 in a free lecture configuration. Each chair has a tablet arm. Seated capacity up to 54 in a Board Room configuration. 28 rolling chairs around U-shaped tables, 26 seats around the perimeter. If you need to request a setup alteration, please submit a description of the layout with your event request. ERC staff will reach out to you to discuss the layout alteration. 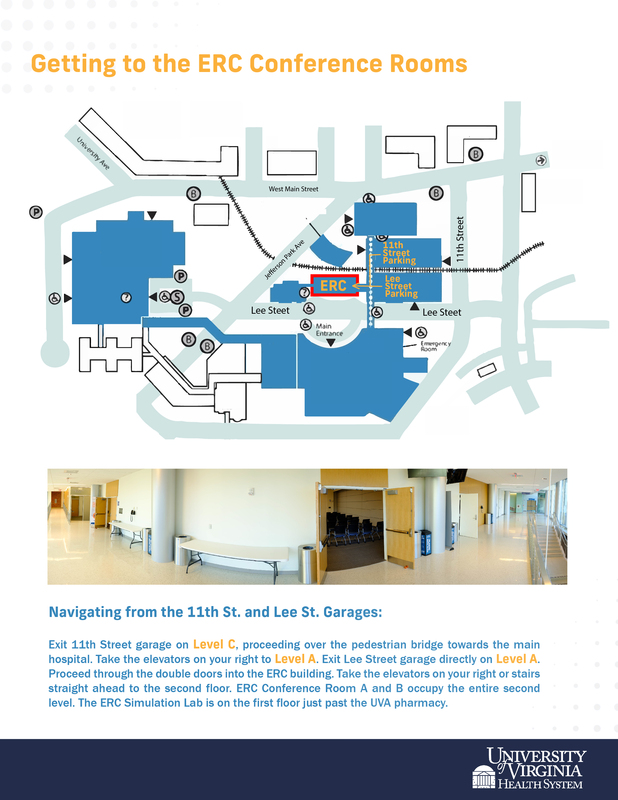 Here are some directions to help you find us! Our staff will meet you at the beginning of your reservation to make sure tech is setup properly. AV controls are run off an intuitive touch panel located at the podium, and our staff is happy to provide a 5 minute training on this interface. Audio and video support is provided by Stephen Simalchik in the GME office. If any equipment malfunctions please dial 434-409-7951 for technical assistance, or visit the GME office. It is our goal to accommodate as many requests for space as we can. There may be instances where an unexpected Health System need conflicts with your existing reservation and your reservation may need to be cancelled or rescheduled. If you know that your meeting will not be held after you reserve the room, please email us or call as soon as possible to cancel the reservation. Failure to show up for a reservation you’ve held may jeopardize future reservations. Food may be consumed inside the ERC rooms. Buffet tables are provided for catering which must be set up outside of the Auditorium rooms. There is a small kitchenette (sink, counter) for your use if needed. It is the responsibility of the event organizer to ensure that all food is removed from the Auditorium and that the catering setup is clear no later than 30 minutes after the event has ended. Failure to clean up after an event may jeopardize future reservations. Food cannot be dropped off/picked up in front of the ERC, as this is patient only space. There is a loading lane behind the Emily Couric Cancer Center where the back door of the ERC can be accessed. Temporary loading only is allowed in this space, you cannot leave or park a vehicle here.